Rock the red, white and blue on the Fourth of July with Washington Capitals defenseman John Carlson and the Stanley Cup in Bethesda Row. Carlson and the Stanley Cup are set to appear at a charity event on Bethesda Lane on Independence Day afternoon. Fans can purchase $20 tickets online with ticket sales donated to Michael Mosier Defeat DIPG Foundation, a Bethesda nonprofit funding research for a cure against the childhood brain tumor diffuse intrinsic pontine glioma. Fans can view the Stanley Cup, enter in raffles, among other activities on the Row. Mamma Lucia is scheduled to cater the event with hot dogs, pizza, and beverages. Fans can also purchase a $500 VIP ticket which includes a guaranteed professional photo with Carlson and the Cup. Carlson re-signed a new eight-year $64 million contract with the Capitals on in June. 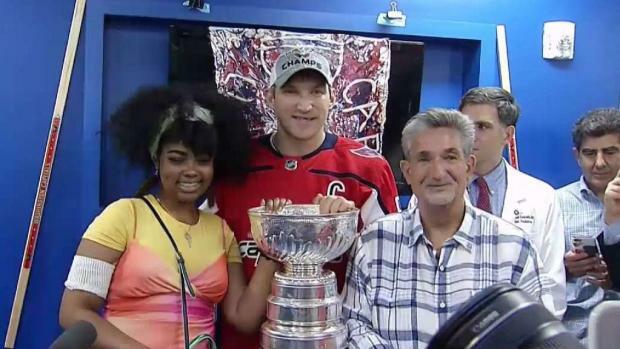 Alex Ovechkin visited children at MedStar Georgetown University Hospital as part of his epic Stanley Cup victory tour.